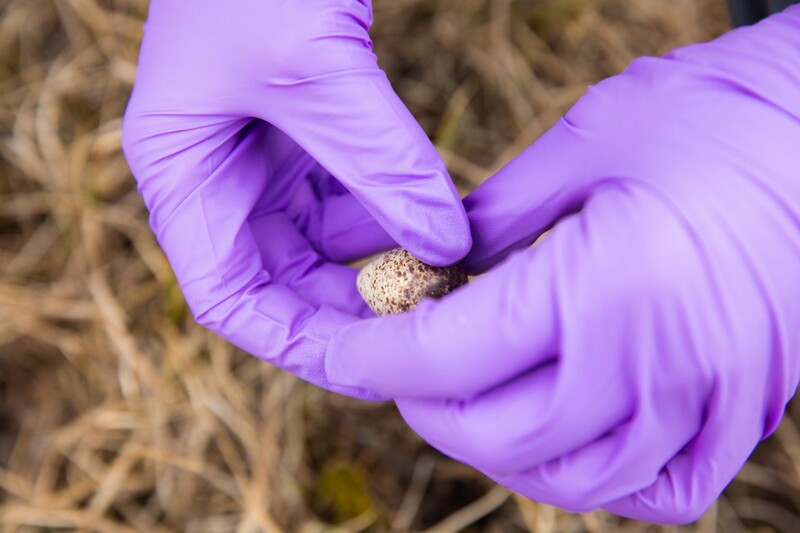 She turns over a small speckled egg in her gloved hand, looking for signs that a baby semipalmated sandpiper is trying to emerge into the edge of this vast northern landscape. 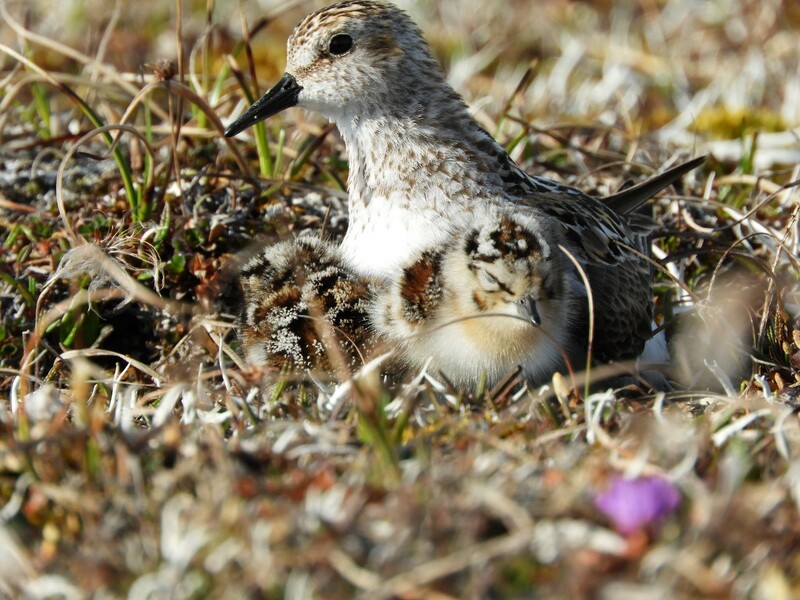 Her brief field research season gives a glimpse into the world of Arctic nesting birds that not many people see. 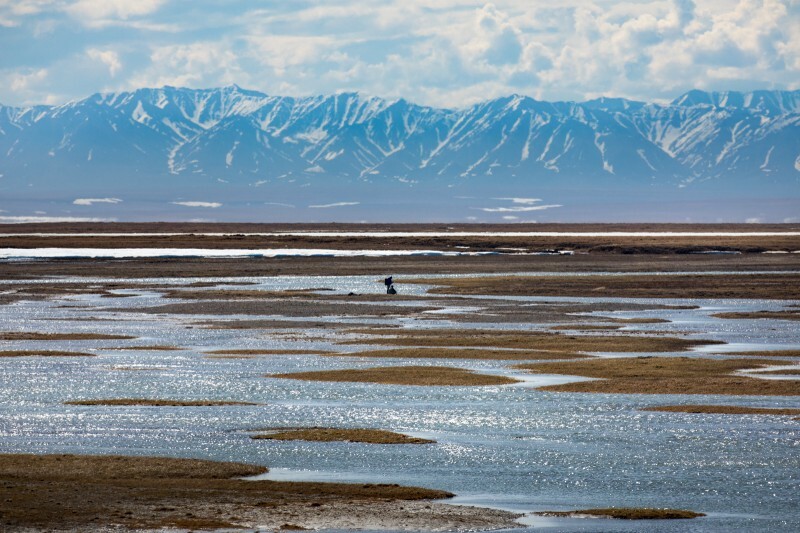 It is June on the western coastal plain of Arctic National Wildlife Refuge, and the land is poised and waiting. 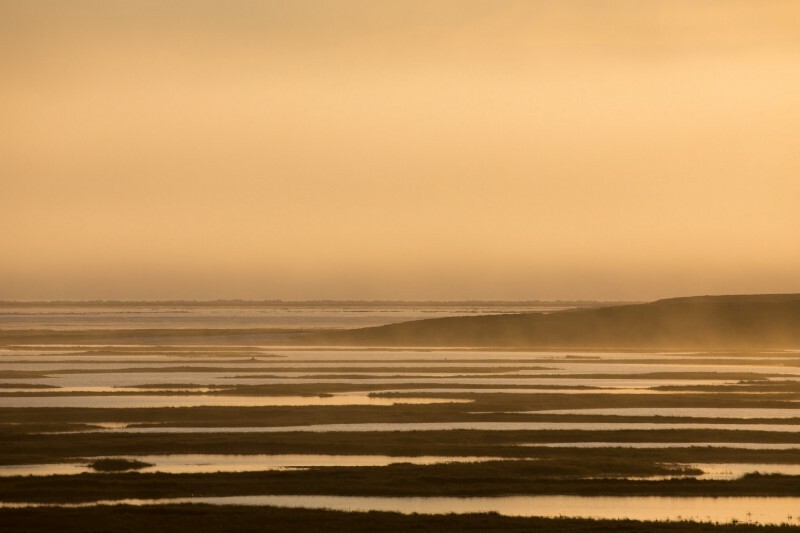 At a casual glance, the open savannah at midsummer seems mostly empty —windswept grasslands, blue and grey ponds, boggy mudflats, cut through by the still-icy braids of the Canning River as it empties from the Brooks Range into the Arctic Ocean. 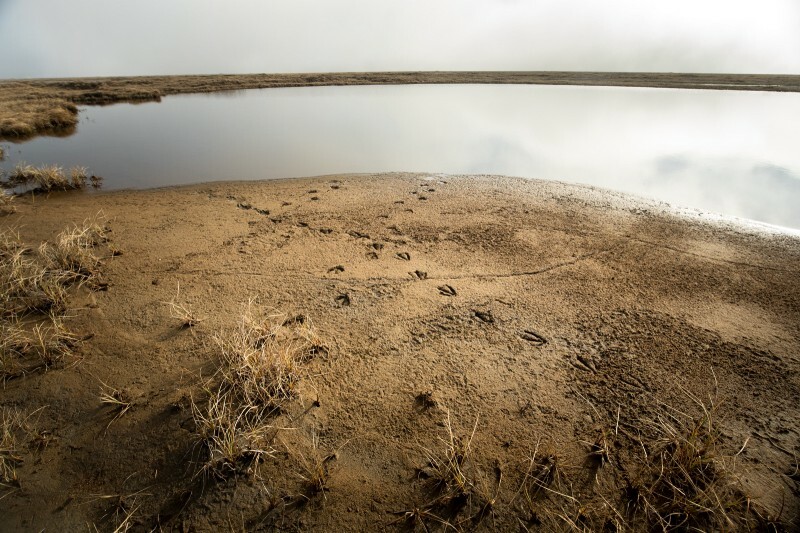 Look closer: webbed tracks trace through the mud, snowy owls glide and hunt under a sun that doesn’t set, and thousands of eggs lie hidden in their tundra nests — a giant Easter basket filled with the future of shorebirds, waterfowl, and birds of prey. 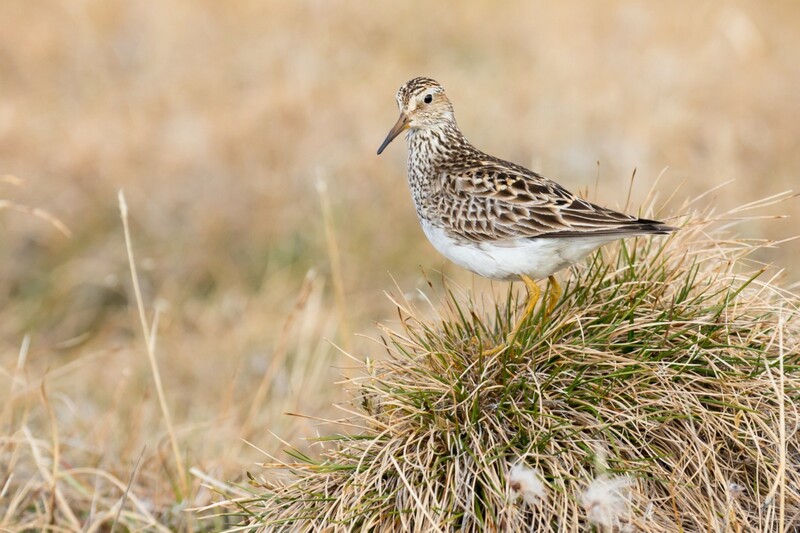 For birds from all over the western hemisphere, as well as parts of Asia, the high Arctic is a summer destination location, sometimes many thousand miles from their winter homes. The life that blooms at the peak of summer includes the infamous insect of Alaska, the mosquito. When the hordes that plague both caribou and people hatch from the wetlands, so do the tiny balls of fluff that will devour them. 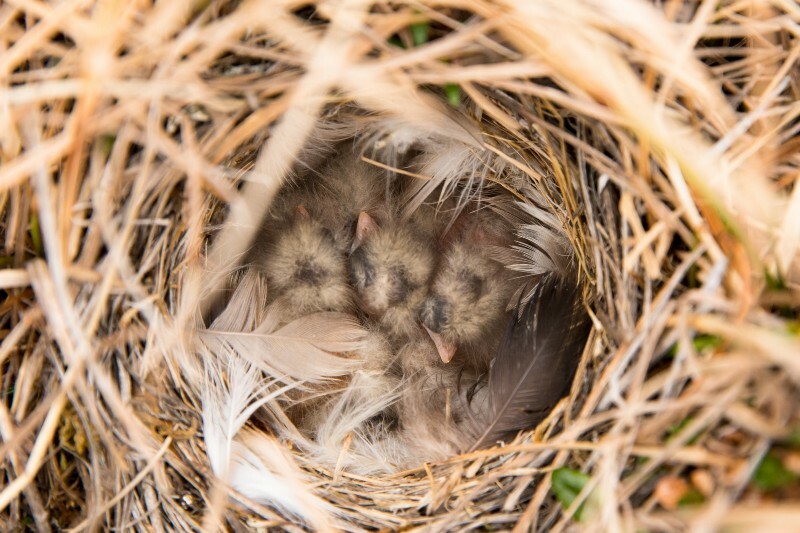 “The birds have essentially unlimited food for the babies to grow, and so they can fatten up and fly in just a few weeks after they hatch,” says Schulte. 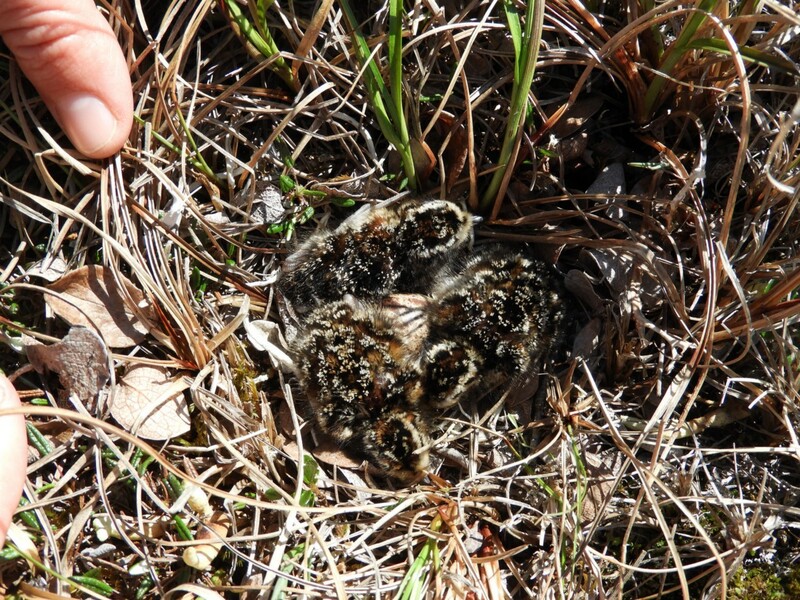 This bottomless feast combined with a relatively low number of predators creates a vital nursery for baby birds. 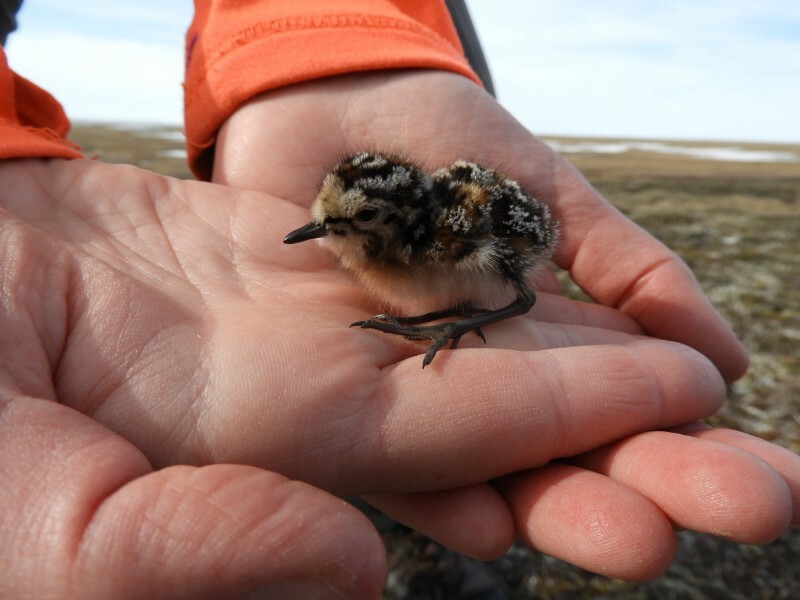 “It’s important because the only recruitment that these populations have are the young chicks or goslings that hatch out on the tundra and migrate down south. This is their entire opportunity for population growth,” notes Kennedy. Maybe you’ve seen them. The incredible flocks of 300,000 semipalmated sandpipers, landing after a week of non-stop flight to fuel up along the beaches of New York. 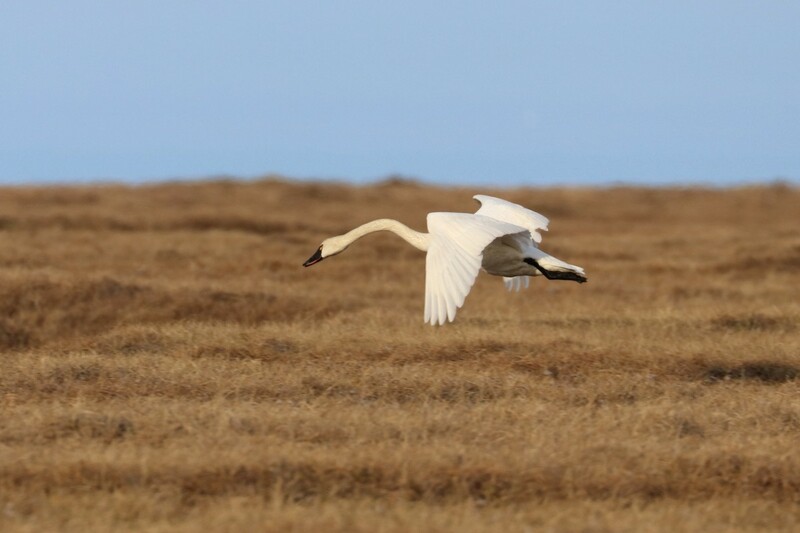 You may have spotted graceful groups of tundra swans paddling on a wintery lake in Oregon, hunted long-tailed ducks from a layout boat on Lake Michigan or sat among a goose spread in Texas, or met the silent gaze of a snowy owl in Minnesota. 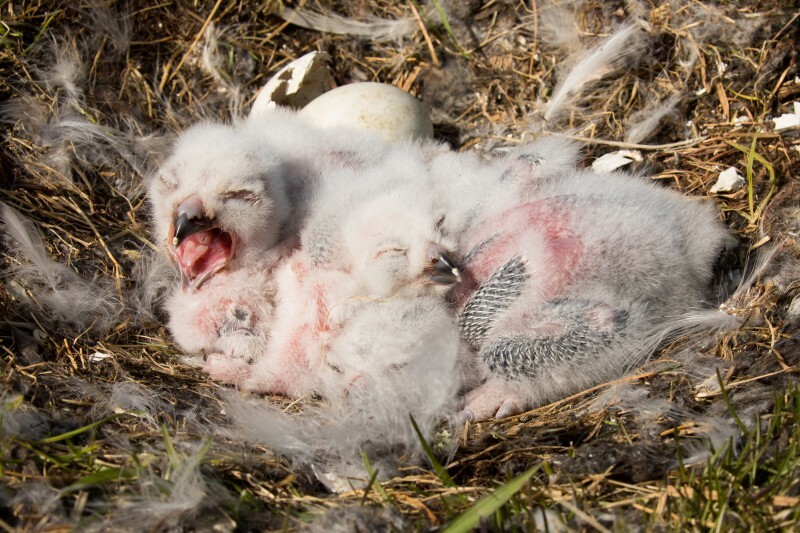 Whether your state is in the Pacific, Atlantic, Central, or Mississippi flyway, you have a connection to birds that nest in Arctic. 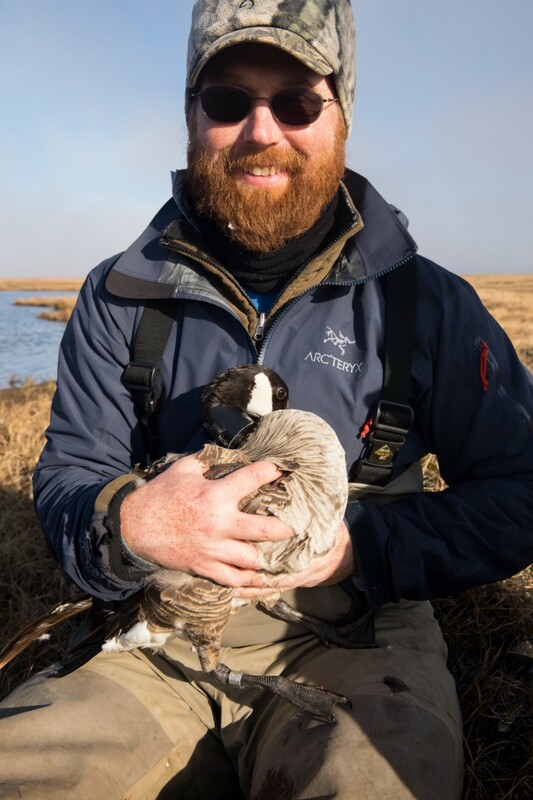 For Arctic Refuge bird biologist, Chris Latty, this connection is one of his favorite things about coordinating research at the Canning River Bird Camp. 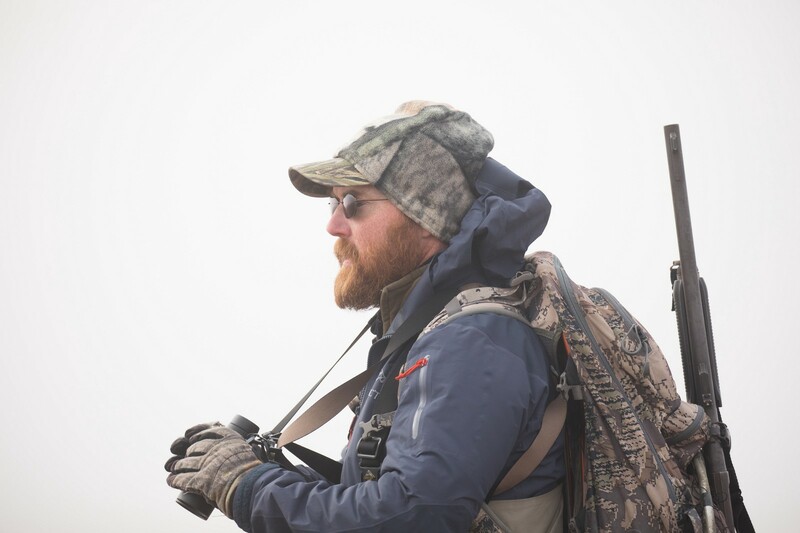 Growing up in Michigan, he loved hunting waterfowl and credits the time spent outdoors with his decision to pursue wildlife biology. 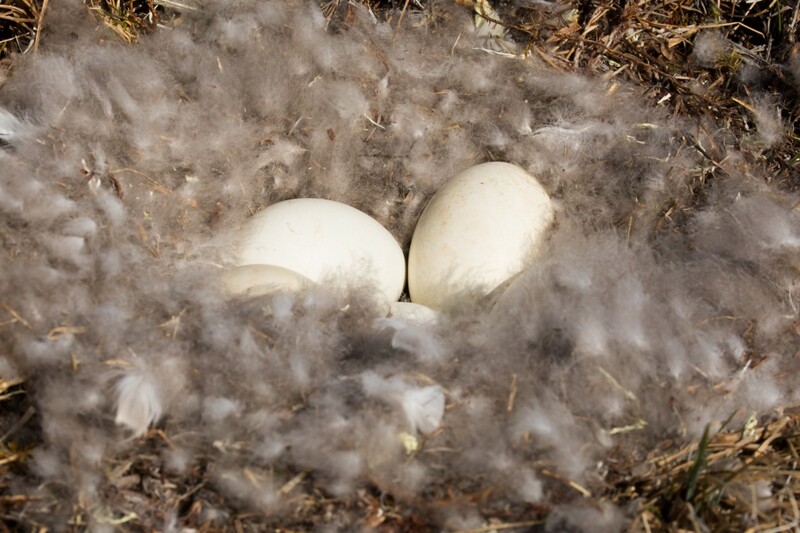 As he speaks, Latty cradles a cackling goose just trapped on a nest. “Geese are expanding across the coastal plain, and the cackling geese numbers on the western side of the Refuge have grown about 5 fold over the last 30 years… but we don’t know which population they belong to, where they winter.” This is the first year of a study to fit GPS tracking collars on the geese that will log their location every 2 hrs, then upload the data as the birds pass by cell towers during migration. Untangling the mysteries of bird movement is a major focus for research partners collaborating with Latty at the study site. 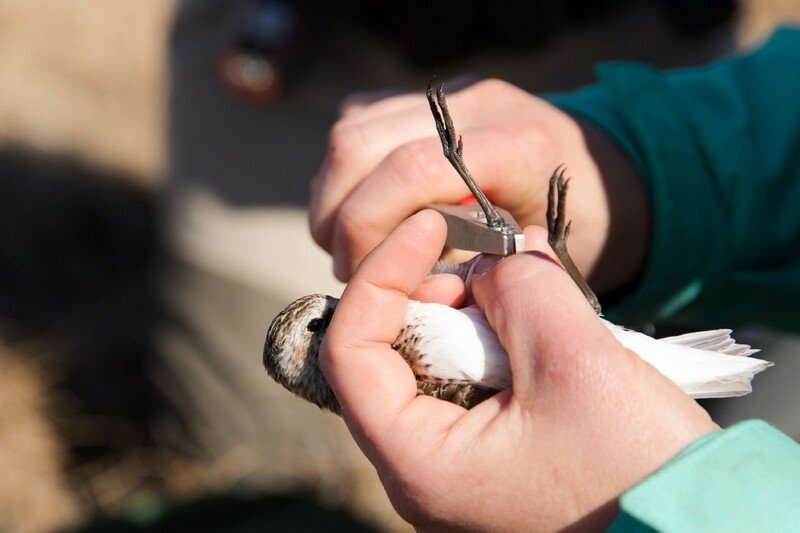 Schulte spent much of his field season with the hope of retrieving a tiny transmitter backpack from a small shorebird called a dunlin, captured and tagged last year on the Canning River delta. Using this information, partners and managers can focus conservation efforts to best serve the birds. Not all birds in the study area receive high-tech location devices. 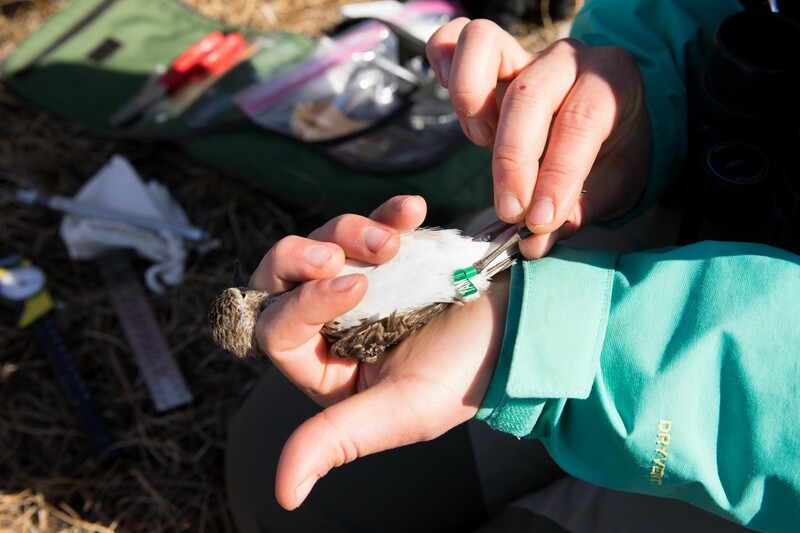 As they search for and monitor shorebird nests, the research crew will capture birds on the nest, collect information about their health, and place identification bands and tags on their legs. Re-sighting these markers can also contribute to our understanding of movement patterns, and anyone can help! · A small aluminum band with a 9 digit unique identifier. Valuable if the bird is recaptured or retrieved in the hand, but otherwise too small to read. · Alpha flag: the color of the flag indicates the country where the bird was captured, and the three letter code is unique to the individual bird. Dark green is the color for the United States, white is for Canada, orange for Argentina, etc. · Site band: a solid colored band that indicates the location where the bird has been captured. 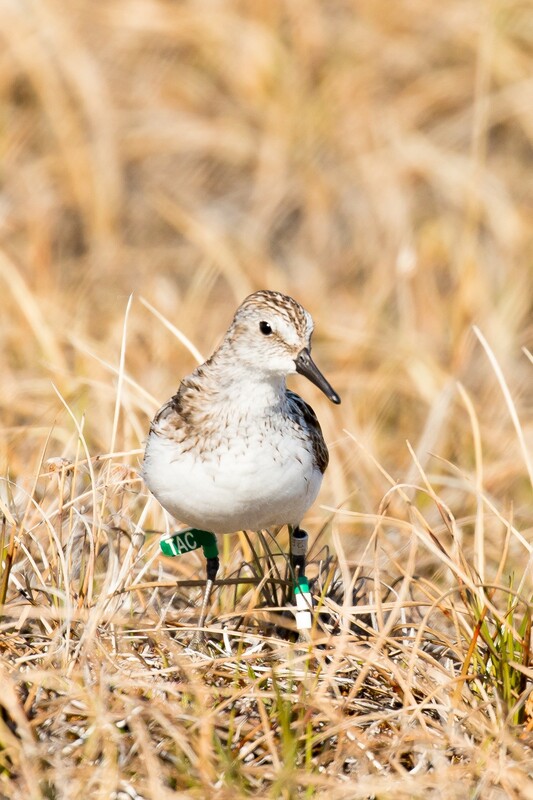 You can help monitor shorebird movements: if you see a bird with bands, identify the species and location and note the colors and letters. With a zoom camera, you can take photos that will be very helpful to researchers! Learn more about the bands and how to submit your sightings here. Lisa Kennedy shares different types of bands used on the Canning River and talks about how you can help with band re-sighting and reporting. 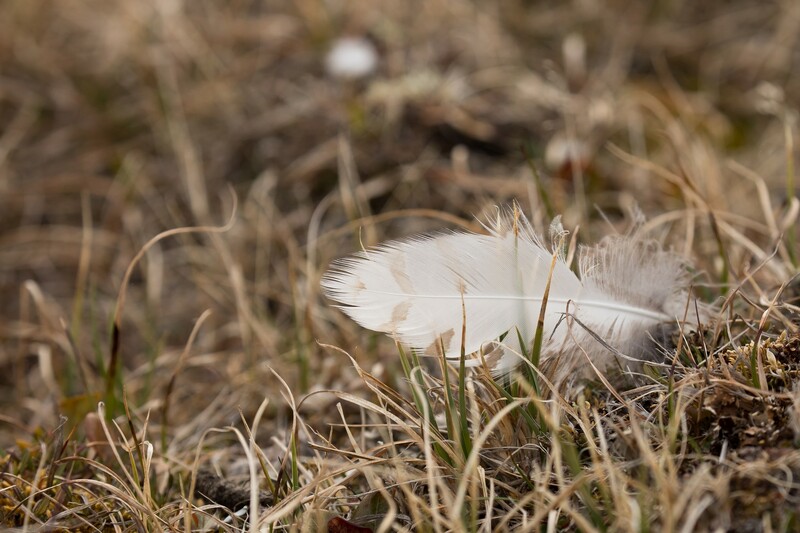 Even though we might not have all the answers about where Arctic birds go after they leave their nests, the birds themselves have an expert sense of navigation and destination. Coming soon to a beach, field, or lake near you: feathered fliers from the far north of Alaska, finding their winter home.